Originally published on the author’s Facebook page and republished here with her permission. It’s not enough to laugh at Donald Trump anymore. 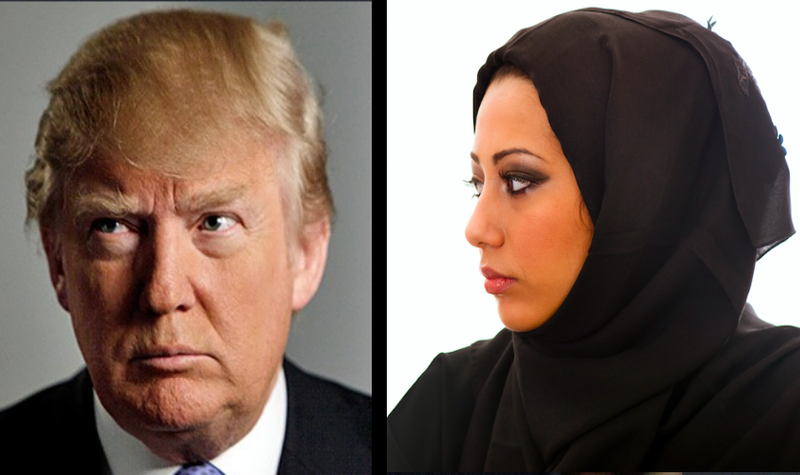 The rhetoric about Muslims has gotten so nasty – and it’s everywhere, on every channel, every newsfeed. It is clearly fueling daily events of targeted violence, vandalism, vigilante harassment, and discrimination. I want you to know that it has gotten bad enough that my family and I talk about what to keep on hand if we need to leave quickly, and where we should go, maybe if the election goes the wrong way, or if folks get stirred up enough to be dangerous before the election. When things seem less scary, we talk about a five- or ten-year plan to go somewhere where cops don’t carry guns and hate speech isn’t allowed on network television. And if you don’t already know this about me, I want you to know that I was born in this country. I have lived my whole life in this country. I have spent my entire adult life working to help the poor, the disabled, and the dispossessed access the legal system in this country. And I want you to know that I am devoutly and proudly Muslim. If you ride public transportation, sit next to the hijabi woman and say asalam ‘alaykum (that means “peace to you”). Don’t worry about mispronouncing it; she won’t care. Just say “peace” if you like. She’ll smile; smile back. If you feel like it, start a conversation. If you don’t, sit there and make sure no one harasses her. If you have a Muslim work colleague, check in. Tell them that the news is horrifying and you want them to know you’re there for them. Talk to your kids. They’re picking up on the anti-Muslim message. Make sure they know how you feel, and talk to them about what they can do when they see bullying or hear hate speech at school. Call out hate speech when you hear it. If it incites hatred or violence against a specified group, call it out: in your living room, at work, with friends, in public. It is most important that you do this among folks who may not know a Muslim. Set up a “learn about Islam” forum at your book club, school, congregation, dinner club. Call your state CAIR organization, interfaith group, or local mosque and see if there is someone who has speaking experience and could come and answer questions about Islam and American Muslims for your group. They won’t be offended. They will want the opportunity to do something to dispel the nastiness. Write Op Eds and articles saying how deplorable the anti-Muslim rhetoric has gotten, and voice your support for Muslim Americans in whatever way you can. Call your state and local representatives. Let them know that you are concerned about hate speech against your Muslim friends and neighbors in politics and the media, that it is unacceptable and you want them to call it out whenever they hear it, on your behalf. Out yourself as someone who won’t stand for Islamophobia, or will stand with Muslims. There is an awful lot of hate filling the airways, and there are an awful lot of people with access to the media and/or authority stirring the pot about Muslims. Please help fill that space with support instead. Post, write, use your profile picture or blog to voice your support. Engage the Muslims in your life. Make sure you really feel comfortable standing for and with your Muslim friends, neighbors, coworkers. I can tell you that in addition to the very real threat to their civil and human rights that Muslims are facing, we are dealing with a tremendous amount of anxiety. While we, many of us, rely on our faith to stay strong, we are human. This is not an easy time. What you do will mean everything to the Muslim Americans around you. Thank you for reading and bless you in your efforts. Sofia Ali-Khan is a Muslim American public interest lawyer now writing and raising kids in the suburbs of Philadelphia. She is an Advisory Board member of CAIR-Philadelphia and wants you to vote against hate in every election.